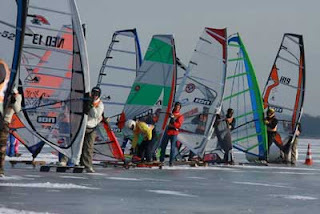 Who ever thought that 2009 would bring Icesurfing back to the Netherlands. Who would ever thought 2 big icesurfing events would take place in Europe! Icesurfing is HOT, if you asked me 1 year ago about, I wouldn't even know about icesurfing events. Now I know Northern & Eastern Europe has a very big competitive group Icesurfers. But 2009 brings good winds & ice. I just hope this year the good winds will continue! Windmeters read over 40kn today in Den Helder!